Master Japanese scripts with this straightforward guide from Teach Yourself - the No. 1 brand in language learning. 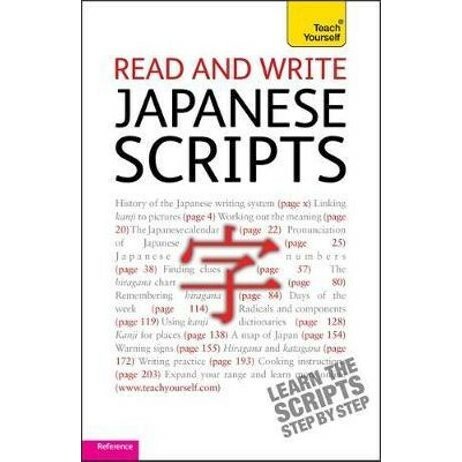 Read and write Japanese scripts is a clear step-by-step guide to the written languages, with plenty of examples from real-life texts to show how they work in context and lots of exercises to reinforce your learning. This new edition has an easy-to-read page design. Now fully updated to make your language learning experience fun and interactive. You can still rely on the benefits of a top language teacher and our years of teaching experience, but now with added learning features within the course and online. Helen Gilhooly has lived and worked in Japan and has extensive experience of teaching Japanese and writing materials for learners of all ages. She has an MA and PGCE in Japanese and is currently the Language College Director of Aldercar Community Language College in Derbyshire. She is also a teacher trainer of Japanese at Nottingham University. TY Japanese Conversation (CD 07/06); TY World Cultures - Japan; TY Beginner's Japanese; TY Beginner's Japanese Script.